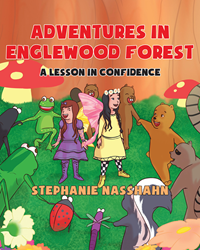 Recent release “Adventures in Englewood Forest: A Lesson in Confidence” from Page Publishing author Stephanie Nasshahn is a charming story highlighting the benefits of believing in oneself and the rewards of helping others. Stephanie Nasshahn, an avid gardener living in beautiful western Colorado who is inspired to write children’s books by her beloved grandchildren, has completed her book, “Adventures in Englewood Forest: A Lesson in Confidence”: a sweet story of friendship in an enchanted forest. Raven Cordelia and Kaylah Moonbeam are fairy sisters who live in the enchanted Englewood Forest. These two fun-loving sisters have adventures with the reader and the lovable creatures of the forest while learning valuable life lessons. Published by New York City-based Page Publishing, Stephanie Nasshahn’s engaging story offers interactive fun for elementary-age readers. Readers who wish to experience this gripping and potent work can purchase“Adventures in Englewood Forest: A Lesson in Confidence” at bookstores everywhere, or online at the Apple iTunes store, Amazon, Google Play, or Barnes and Noble.